The patented design of the Bango® was created by Trey Burnette, celebrity stylist, to bring this fool-proof tool to consumers everywhere. Trey works at the prestigious Román Salon, nestled in the heart of West Hollywood, where his talents have allowed him to work with Hollywood celebrities, European Royalty, top fashion magazine editors and people that just want to look fabulous. He invented Bango® after noticing his clients would trim (and mess-up) their own bangs between haircut appointments. The tool is calibrated with a three comb tension that holds hair in place as tightly as a stylist would. It has straight and arched cutting edges with teeth that work to create numerous bangs styles including: blunt bangs, textured bangs, side bangs, top-layer trims, short hair, men’s bangs and children’s bangs. 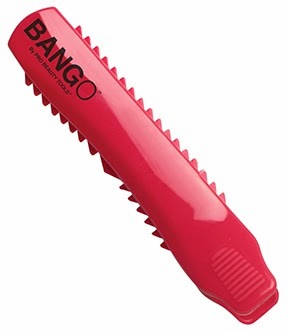 For just $19.99, you can skip the salon and become your own speedy stylist by using the Bango® kit which includes a Bango®, a 6” pair of precision shears, 2 sectioning clips, a comb and an instructional DVD. My kids bangs tend to grow much faster than the rest of their hair. I tend to just take the scissors and zip across them, never getting them perfectly straight. I go shorter and shorter trying to even them out. I was very excited to review Bango and to work with the kids and perhaps my own hair in keeping our bangs under control. The Bango was very easy to use. It comes with an instructional DVD that shows exactly how to do each style. Wonderful product for the in between salon visits and for the kids hair.